Then the bear market pounced. It chewed on the head of that gain down to the bone at around +60 plus points by the closing claxon. Astrologically speaking, the stocks are down and up Uranus squared Pluto surpassing, manic-depressive jumps out the limb lows to rebound in resurrection high pies in the sky to then collapse at the end of the day like a soufflé. Perhaps some market reflection buzz-killed the Italian job when investors and bankers and CNBC talking heads started calling the EU bond buyouts of Spanish and Italian ballooning debts – source of the volatility — another version of printing money without actually printing money. This farce is better known at QE1 and QE2, the acronyms for two tries in America of Quantitative Easing of debt practiced by the US Federal Reserve. 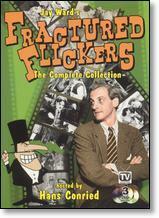 Poster for Fractured Flickers. This early 1960s show took silent films and added silly dialogue to make social and political satire. Jay Ward created this show. He also gave us comedic icons Rocky an d Bullwinkle, Fractured Fairytales, Roger Ramjet, Underdog and George of the Jungle. The Fed had manufactured credit out of thin air the first half of 2011 to the tune of $600 billion by June. The flush of funny money goes out into the open market and buys securities, government bonds from all and sundry offering these on regular bond markets. Credit is thus created and that voodoo money enters the economy because our system uses fractured flickered fractional reserve banking. That means for every voodoo dollar worth of credit the Fed conjures out of thin air it multiplies credit value times ten. This is Mickey Mouse economics 101. The sorcerer’s apprentice in a Fantasia Federal Reserve, Mr. Ben Bernanke, waves his wand and the broomstick carrying buckets of water multiplies by ten. That means if Ben flashes his wand around publicly, conjuring $600 over the first six months of 2011 it creates a money supply of $6 Trillion. Since the trillions given by Bush and Obama to bail them out did not reform banks, they are not lending but sitting on the cash. Time, therefore, for this Mickey Mousing Fed to put on its purple cone wizard hat with stars, crank up a little Paul Dukas symphonic thunder and start multiplying those broom sticks to flood the market with credited cash as real as a cartoon. As long as everyone is captivated by the movie, it kinda works. That is, until Mickey gets the boot and the magic credit buying ends, like it did in America this June. Soon after the economy started to decline again as the QE2 sank behind the smoke and Mickey Mouse mirrors. The EU banks are going Bernanke on you and Spain. 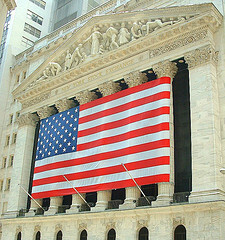 That had some part in deflating the soufflé on Wall Street, Friday. This voodoo stimulus is only a temporary fix like just about everything leaders and economist do around the world about the systemic problems undermining this global economy. Something else might have unleavened the bread and buttered numbers in the plus. A rumor rat holing around Wall Street that credit rater Standard and Poor’s (S&P) was going to cut down the US credit a peg or two this weekend from a triple to double star rating. Rumor became soon fact. The downgrade will be explained as a lack of confidence in the US political leadership, both president and US congress, as the fundamental cause. Kicking the problem down the road to November when a committee will report actual cuts suggested is anticipated to be just as acrimonious and politically charged as the farce of financial bickering we saw this summer. Yet, the S&P by committing itself to this downgrading path whilst other important credit rating bodies are not puts their credibility into doubt and confusion. Moreover, the S&P mathematical mistake of calculating debt off by 2.5 trillion dollars… The result: more leadership crisis in the judged as well as the S&P judges. My oracle presented this future when I set down to write Predictions for 2011 in October 2010, publishing the following findings on 21 December 2010. 2011 will be the year of the politically foolhardy. I’ve never encountered a year so murky as I plunged my “oracle” in a dive off the “divining” board. …There are new kinds of wars coming. The “money wars.” Conflicts where weapons are decimal points: e-strikes on the airwaves in acts of e-terrorism between nations clashing with armies of ones and zeros. … If [Obama] doesn’t fire and hire the right economic advisors to win his battles with the economy, Obama will fulfill my oracle’s initial warnings logged in a HogueProphecy Bulletin posted on 10 March 2007. [See Obama Nation] He will roll in to his destiny four years too soon as a potentially great president unripe for office. …He’s now moved from bad Wall Street insiders (like Geithner) to worse: associates of secret plutocratic societies, such as Austan Goolsbey – a member of Skull and Bones. I don’t foresee how Obama can win a second term on his own merits if he keeps picking such advisers. One of the worst and most unripe executive choices made by this professor of constitutional law who never had any executive experience in business or government until he started his on the job training in the oval office on 20 January 2009, was to hire Wall Street insider and co-bungler of the Bush bailout, Timothy Geithner, as Secretary of the Treasury. With job creation flat and for the most part not on the table this summer added to the marginalizing of Geithner by an “Iago” closer to Othello’s ear about the economy, the Skull and Bonesman, Austan Goolsbey, rumor has it Geithner was about to resign. Obama cites President Lincoln as his role model; yet, true to his un-Lincoln-like immaturity as a leader, he pledges for now to keep his “General McClellan” commanding the front in this financial war with the Right. Thus, Geithner will continue to lose the economic conflict for his president as 2011 drags on. The year 2011 will bring a new understanding of what this decades-long Global Recession truly is: a Cold Depression. It’s an economic version of a doomsday stand off between runaway deflation and inflation, armed, cocked and ready by deregulation of the banking and financial systems, waiting in mute threat in row after row of foreclosed houses, ranked down empty suburban streets like row after row of silent missiles in their silos on the Midwestern plains. We all wait for someone on any side of this economy to drop “the bomb” – the debt bomb. World wars couldn’t spread in the Cold War climate, nor can a hyper-inflated balloon economy go “pop!” at the sudden thundering of an apocalyptic debt bomb, if the economy will remain static. This standoff stasis, if sustained, even if it means little GNP growth for a decade, means no sudden, thermal-economic collapse. 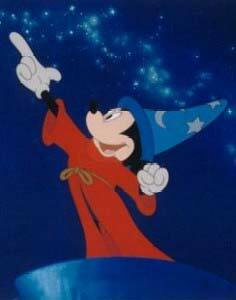 Mickey Mouse in the Sorcerer's Apprentice segment of the movie "Fantasia" to the music of Paul Dukas' tone poem "The Sorcerer's Apprentice". In the name of freeing up the economy, the new Congress will begin pulling off the bandages of Bush’s TARP and other money wad bandages of Obama’s reforms. They’ll be playing with the wounds. The bubble Obama let the financial banks and Wall Street start blowing up again will balloon rapidly under this new Congress. You could find stocks climbing well beyond 12,000 points on the Dow Jones Exchange. Yes! You could see that, especially if Republican House and Senate legislators hold onto the panacea that cutting taxes cures all. They keep putting their blind ideological faith in mathematically implausible numbers rather than good old-time Republican business acumen. …For a long time now, what is presently preached under the Republican brand isn’t the fiscally conservative, socially tolerant stalwart of moderation. A deep polarity is coming in political-economic discourse in 2011. The midterm elections split the Congress. Gridlock on economic reform is coming. If the Republicans let the right wing partisan cat jump out of the Tea Bag, they will precipitate the next worldwide financial crisis in US leadership confidence. Has all of this not happened, especially a worldwide loss of faith in US economic and political leadership? I have written at length in Predictions for 2010 and Predictions for 2008 that a two-year probation would follow the foreseen Great Recession of 2008. If systemic failures are not reformed and purged out of the banking, housing systems and Wall Street, then starting as early as October 2010 and no later than mid-2011, we would embark on a Second Recession. Bernanke believes that the Federal Reserve printing yet again another 600 billion-dollar wad for 2011, will stave off deflation. (I forewarn you now; he’ll print more than a trillion before the end of 2011). For this new bubble of the buck to succeed, he and the United States fiscal policy will need monetary help from the Chinese and Russian governments inflating the value of their currencies. With economic currency nationalism on the rise in 2011, economic coordination won’t be forthcoming. The contagion of a European bank crisis in 2011 could easily spread around the world infecting the interconnected US and Chinese banks. If Europe goes deeper into recession, it affects Chinese imports and US business. Wrestling with a zombie EU Bank crisis, European leaders will test the waters of austerity programs finding they make for a more shaky European banking system. China made some symbolic moves to increase the true value of its currency but not enough as of yet to have real impact. Half the year remains before us. Russia did nothing and is waiting on the fence so far. Spain and Italy will get their Mickey Mouse QE1 experimental bond credit boost of devalued Euros. The austerity to come may see riots in the streets, Greek style. It is initiating a Second Recession. I asked my oracle to stop waxing like “Nostradamus the Pessimist” and give signs of positive solutions. 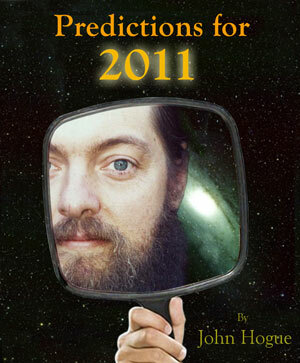 They are here: Predictions for 2011. This entry was posted in Economy and tagged -512.76, Austan Goolsbey, Barack Obama, Ben Bernanke, Bonesman, Bush, CNBC, Coast to Coast AM, Cold Depression, Debt bomb, Democrat, Dow Jones Industrial, EU Central Bank, G.W. Bush, GOP, Great Recession, Hogue, Italia, Italian debt, John Hogue, Lincoln, McClellan, MickeyMouse, Nostradamus, Obama, Paul Dukas, prediction, predictions, predictions for 2011, prophecies, prophecy, QE2, Republican, S&P, Secretary of Treasury, Skull and Bones, Sorcerer's Apprentice, Spanish debt, Standard and Poor's, TARP, Tea Party, the Fed, Timothy Geithner, voodoo dollar, Wall Street. Bookmark the permalink. Post a comment or leave a trackback: Trackback URL. Thanks Hershel. They run fine on my server. It may be something to do with your software or you server. My Firefox works fine. Thanks, Hershel. From my side alles gut. Have your tried another browser? Dear John where can I get an oracle like yours? If your an expert on Nostradamus than were not in control of the future. Things are destined to happen. Our future is already fortold isn’t it? No, Timothy. In my experience as a prophecy scholar who himself also makes forecasts using a certain divination technique, if you ask me there is not future written in stone. It only “appears” to be preordained solely because human beings are programmed by their “dis-education” system to be robotic, to borrow stupidity, to suppress their divine-given genius as souls with and identity of egoism. Meditation is the only way I know to transcend this imposed roboticness and stupidity and bring back the suppressed intelligence of soul. If you are interested, I can share with any of you information about my meditation techniques. Copy and past this link into your browser (hogueprophecy.com/contact/) and that will take you to the contact page where you can enter your request to have me freely share the information via email. People complain about Goverment spending and vote for the Tea party but they don’t want to give up there perks either. Like Raise taxes. yes lets cut everybody else not not from me. Obama has shown leadership beacasue he wanted a balanced plan and the republicans wouldn’t budge on taxes for the wealthy. Obama, Geithner and Bernanke have dug their heels in, so I gather it’s The Year of Multiple Choices in play. Any intellectually honest person who says that Sarah Palin cannot lead or should not lead this country is lying to themselves. Obama is not a leader. Every day we see what a useless disengaged president he is. I shook my head is disbelief and disgust when the good people were fooled into believing in all the smoke and mirrors and false promises of hope and change. I have more faith in the people of this country not to be fooled twice. Folks, we need REAL hope and REAL change and we need a REAL leader to lead of through this difficult time. We do not have one in Obama. Sorry, John, but it has to be apparent by now your original prediction of “too soon coming to his destiny” is here. And you were QUITE kind in putting it that way. Before he came to be president he had accomplished NOTHING. Zip zero zilch. I did foresee that danger and documented it in articles like Obama Nation (copy and past this in your browser: hogueprophecy.com/2007/03/the-obama-nation/). I wrote it nearly a year before the primaries happened in 08. But the future is made of a network of timelines radiating from the actions committed in the eternity of the present. And though my political and other predictions have a proven accuracy, they do so more from the robotic behavior and mass hysteria of people under the influence of their unconscious habits and programs. I am actually working towards being less accurate about the future, because Hogueprophecy.com is about bringing people back to their meditative intelligence where they can STOP being predictable. Here is the leader we need. Oracle or not, John, an whether you like her or not, you have to respect the fact she actually ACCOMPLISHED A LOT and has leader qualities. Sarah Palin. It is not about liking or not liking what the oracle predicts. The Oracle doesn’t care about the infatuations of mice and men. It predicts the future consequences of our actions. And if we remain predictable, some of these timelines become our present, some not. BTW, Thanks for the promotion Ray, but everybody be advised, do not send links to political action committees or political campaigns, left, right or center into these comments pages. Hogueprophecy is not to be used that way. You can certainly tell readers here to go political campaign web sites but I will not link you direct to these. You’ll have to google yourself to them. (google, google, google…) Sounds like a Thanksgiving Dinner undercooked. John, to hear you say her reasons she quit the governorship were for “celebrity” or were “incoherent” makes me know you are getting your information from the left and her scared opponants on the Republican side. No Ray. No way. I listened to Sarah’s speech verbatim, live, when she made it and her reasons for quitting were indeed rambling and incoherent. I judge her intuitively from her actions, not from what the right or left leaning talking heads project. I measure the politician by what they say and that goes with how I rate from times Shaun Hannity sometimes speaking “inanity” or Rachel Madow, has fits of Rachel “Mad Cow” or Keith Olbermann works himself up to become “Keith Over-wrought-man”. Palin is measured by her statements and actions in these prophecies. I actually like Sarah Palin. I loved my late father who was very much like GW Bush. There’s a lot of people I accept, like and love that I would never want to see as president of the United States, like my father. I would never like to see even “me” become president of the United States. She had NOBLE reasons…and GOOD reasons to leave. So what “noble” reasons and “good” reasons will she use to quit the presidency? She’s a quitter. The problems inherent in the Alaskan system that let’s people load up legal suits on public officials is something she could have fought as governor and a won, getting that law struck down. That would have showed her to be someone who can fight an injustice. Instead she ran from it. Took the easy road. Bugged out. Have you any idea how much harder the challenges will be when she is president. If that little problem in comparison in Alaska was enough to see her bug out she’s showing herself to be weak and ready to run when the going gets tough. There is no noble reason for being a quitter, when the people have voted you in to do a job for them. Republican Presidents have died in office for the sake of their people, like Lincoln. Her reasons can not match his nobility and I predict with complete confidence that the “quitter” label will prevent her from being President of the United States. You heard it and have seen it written here. Remember this prediction, Ray when she buckles again in the campaign of 2012 when Rick Perry and Barbara Bachman consume all the air in her political balloon during the primary debates. If indeed she even runs. I wish you would do some research on this subject. You obviously don’t know much about her or the details of her history. If you knew the truth, you would be comparing her destiny to that of George Washington instead of ridiculously comparing Obama to Lincoln. It doesn’t matter what you or I think. I server the vision of the oracle, which is often going against the grain of my personal opinions. Obama is a man of destiny that has come to his destiny too soon. And I have made it bountifully clear that he could still falter and miss his destiny to be a great president because of his immaturity, impatience and bad timing. Imagine if Lincoln had been president four years too soon? Greatness is as much a thing of timing as it is ripeness of character. The times made GW Bush a two-term president. And events can also shape that. Without 9/11, Bush was on his way out as a one term wonder. FDR would have been a two-term mediocrity without the onset of World War II. Obama misjudged the times and came to the job immature. The learning curve is steep. If he somehow survives his first term it is because the Republicans will choose a candidate that is viewed to be worse than the President. I will say this, Obama will not win the presidency a second time because of his merit. We’ll wait and see if merit will sprout from him in his second term. Personally I don’t believe it. Never have. The Oracle poses another potential. I must honor that, though I have never nor will ever vote for Barack Obama. Now, as you say below that I am an intelligent man then the test is for you or any other reader who thinks that and who doesn’t like what I’m saying about Sarah Palin to pause and reflect on it. If my “intelligence” goes against your hopes and fears, have I suddenly become dumb or are you placing your expectations against my intelligence? John, I think you are a very intelligent man, but I have to call you out on your ignorance on Sarah Palin. I fight this ignorance every day in my life and vow to educate as many people as I can of the REAL TRUTH. I am trying my best to change the destiny your oracle portends. But of all the people in this world, I would never have expected to have to fight you on this. PLEASE PLEASE PLEASE look into the real reasons she left the governorship. Once you know the truth, I don’t expect that you will be saying some of the things you say about her. MY oracle (my heart and my soul) tell me she is the best one to lead this country out of where we are and where we are going. John, is your “oracle” still pulling for an Obama 2nd term? Yes. He will be a second term president. I know it doesn’t make logical sense right now, least of all to me. However, I trust my oracle’s often irrational visions that more than often come true. I have already said in Predictions for 2011 that Obama will not make it to his second term on the merits of his accomplishments but more from the demerits of his opposition. He is already nursing the political “perception” that he is the most adult of the squabbling politicians. That is a good propaganda to nourish in 2012 because perception “is” truth in the lying language of politics. I have also presented before readers in that 2011 book other political destinies that indicate how certain GOP candidates could win in 2012 as much as how Obama could win in 2012. Beyond what I or my oracle predict, the future is changed by the actions of people in the present. Indeed writing a prediction shared to millions, already has changed the timeline because it galvanizes people to make that future right or wrong. Beyond what I or my oracle predict, the future is changed by the actions of people in the present. Indeed writing a prediction shared to millions, already has changed the timeline because it galvanizes people to make that future right or wrong. Should we think of this as the “Ghost of Presidents Future”? i.e. – is the oracle telling us to beware should nothing change in the perception of the voters? I have in my mind that the voters should seek massive recalls of elected officials, in order to send a shock wave through the system, and not wait for events to get so bad that anarchy begins to rule (as in the UK riots). If our government is stuck/paralysed, it is then up to us to unstick it. Perform the political equivalent of the Heimlich Maneouvre, dislodging the foreign object. It would be naive in the extreme to expect the government to unstick itself. They need our help. I wonder what’s going to happen if things take a huge economic nose dive? Let’s say interest rates rise. The government starts increasing taxes on everyone while implementing extreme austerity when people are struggling as it is. Are the people going to finally get so angry that they rise up by the millions and refuse to comply anymore? Are they going to pull their money out of the banks, stop paying their credit cards and all other debts, and stop paying their taxes as well? If this happens in the United States, could it spread to other nations facing economic collapse and austerity? Will the millions in these nations say, “hey if the U.S. can do it, so can we”? Will they also not comply by refusing to pay their taxes and debts? Could this even spread to China? Could millions of Chinese, fed up with their system, refuse to work in the factories anymore for practically nothing and refuse to pay their taxes and debts? What can the corporations and banks do then when BILLIONS of people refuse to comply anymore? Could this lead to a new global economic system? Could this even lead to a world government? Could this be very positive in the long run? If BILLIONS rise up peacefully in unison and say “enough is enough” and release their old beliefs and thought patterns, I am wondering just what could result. If BILLIONS put away their differences, come together, and combine their intellect, what could really happen? Could we be headed for a golden age? When you want to draw attention away from yourself you blame everyone else for the problem. We were told if the budget was cut at least 4 trillion we would see a down grade. The deal that was cut did not cut one red cent. Yep everybody it is the TEA parties fault for not getting the large cuts that was being discussed. Those cuts went by the wayside when Obama went from 800 billion in tax increase to over a Trillion. So if you want to put blame put the blame where it needs to go. OBAMA. We need a leader as president not one who is a figure head. He help creat this mess it was not the TEA Party Congress members. They hadn’t take office after the 2 trillion stemous expense that did nothing to creat jobs. So get off the TEA Party back. The only way we are going to get out of this mess is with massive cuts in government spending. It is going to hurt but think about your own home budget. If you have to cutting spending where do you start first. 1) shut off Cable tv. 3) Stop going out to eat. We all want the military budget cut. Well let me give you a sight at what will be happening very soon. CHINA, who hold a major part of our debt. They will soon being telling the US to spot all construction on all War ships, All tank production and military super weapons. Bring you Ships home and part them tell you get your budget under control. The samething we did to great Britian right after WWI because they owned us a large sum for us helping them pay for the war with Germanany. Kent, here is the leader we need. THIS is what a REAL leader looks like, sounds like and acts like. two stories really sounded the alarm bells for me… on how to help support/set up a safe haven — both for others and for myself — a place that does not participate in acting out and fear… one was an article about theft in community city gardens being ever on the rise and the other is a video of John Lennon on peace, power to the people, and a revolution in the current way of thinking… the sense of interconnectedness is fast fading, it seems, and quickly being replaced with sheer panic and defensiveness. The battles and fires raging in London convinced me of that. All the dark stuff in people is emerging… but without any real certainty or money or reward, how then can people best find a way to gather and unite. And Obama is keeping Geithner around, maybe more in a mummified form, but keeping him nonetheless. Not even a word about changing generals at the front. China gave us a tongue-lashing this weekend and called for a review of the US Dollar and an alternative world currency quest. They downgraded thier rating of us as well, several months back. Washington likewise was as unimpressed with the downgrade as it was with calling S&P unfair. The Asian markets are plummeting, as is NZ and AUS markets. Brace yourself for another Wall Street plunge when it opens Monday. John, my 2 cents: The S&P downgraded during a Mercury Retrograde…so, S&P will probably end up reversing itself thru much travail, trouble and embarrassment upon itself. PJ, it was a good thing that the S&P doled out consequence to stupidity. Now an opportunity has opened up to shame us into positive action. I think the effect of this credit rating drop will hit the markets hard this week. We might need and deserve a further cut of the rate to merely “AA”, losing the plus in November-December. I think a big hit is coming in September for the economy. This could also help shame us to do better. In the simple equation of our times. You stay stupid, you get hit. Get deeper stupid. You get hit harder and harder, until stupid cries “uncle”. Then we can end “stupid”. The last problem for the Elites is the economic uncertainty of competing currencies. Instability creates certain risks and requires constant manipulation for them to maintain their wealth. They have been planning to solve this problem and, in the process, solidify their stranglehold on the wealth of the world. Since they loan out their wealth to all nations, their wealth is constantly increasing through interest payments. But, now, with default in the air, the game is changing. Two things will become the dominant issues in the near future. The first is the foreclosure on assets. The debts of all nations will be allowed to fester until they ripen for the foreclosing. That is why Greece and other countries are being bailed out. They are forced to take on more debt, which they will never be able to pay. The austerity measures forced upon these nations, including America, do nothing to stimulate growth or create jobs. In fact, they are designed to prolong the debt and the agony. The Elites are postponing the final foreclosure until all nations of the world are wallowing in debt. That way, none will be able to fight back. We will gladly sell our most precious assets for pennies on the dollar, rather than have them foreclosed on. The second issue is the unification of currency. As debt and interest become more volitile and unmanageable, the various currencies of the world will compete with each other in an economic WWIII. Food, water and fuel will be the weapons of this war and, the battles will be brutal. Starvation, deyhdration and disease will take the lives of billions of innocents. The leaders of all nations will be unable to keep up with the chaos. They will gladly surrender their sovereignty to end the Economic Wars and to stabilize the currency. At this point, the Elites will have complete and utter control of the issuance of the currency. They will control the currency, the governments, the politics, and the people. It’s WE THE PEOPLE who have the power, not a few thousand elites. They only get away with what they do because we let them. If millions, perhaps BILLIONS, decide to wake up (become conscious) and peacefully put our feet down, there is NOTHING a few thousand elites can do anymore! But as long as we are divided and attacking eachother, that is not going to happen. As long as duality thinking exists, with the Right attacking the Left and vice-versa, or the Christians attacking the Muslims, or whatever attacking whatever, it won’t happen. As long as we continue to give into fear and the false thinking that we are powerless and it’s all the “other’s” fault, instead of taking personal responsibility and becoming conscious of who we really and that true power is mastery of ourselves, we will continue to allow them the illusion of having control over us. Thank you Tea Party. You just cut your own throats. You could not leave well enough alone. You political neophytes don’t understand that government cannot be changed overnight, yet you insist that it must. So be it. Stand up now and take the credit for this self induced crisis, and take your lumps in 2012. Good bye Tea Party! Let’s not forget that we almost had the right agreement with President Obama and Speaker Boehner, that would have prevented the Credit Downgrade. President Obama and Speaker Boehner had agreed upon Four Trillion in Cut’s and 850,000 Billion in new Revenues ( New Taxes ) Then out of no where President Obama moved the Goal Post and demanded One Trillion in new Revenues ( New Taxes ) The original deal that would have put the U.S.A on the right path, slipped away from us by the Poor Leadership of the Presdident and Speaker Boehner. At present we still have a chance to place the U.S.A. on the correct path, with the new Special Debt Commitee of Democrats and Rebublicans with a Balanced Approach of New Revenues ( New Taxes ) and the correct amount of Four Trillion in Cuts. Let’s get the Original Deal between President Obama and Speaker Boehner back on the table! It’s time for True Leadership in Washington from Both Parties. We The People Demand it! After that, a new Amendment to the Consitution requring the United States Federal Government to Balance The Budget, would force Washington Politicians, Democrats and Rebublicans to leave within their means just like any Family or Business has to do. We are all sick of the Politics. Let’s hope that your Oricle can see the possibility of a Good and Expected End. At this point nothing is set in stone, anthing can happen. Even Good Things for All Americans. If an S & P downgrade results in increased gasoline prices and interest rates on personal debts, I am wondering if thousands, perhaps millions of U.S. citizens will rise up and stop paying their mortgages, student loans, credit cards, etc. I am wondering if they will even stop paying their taxes.